Thanks to the constant efforts of Mr. Tim Tilson and Mr. Brian DeWitt, NOVAG held its Winter Game Day event at the Centreville Library on 15 February 2014. 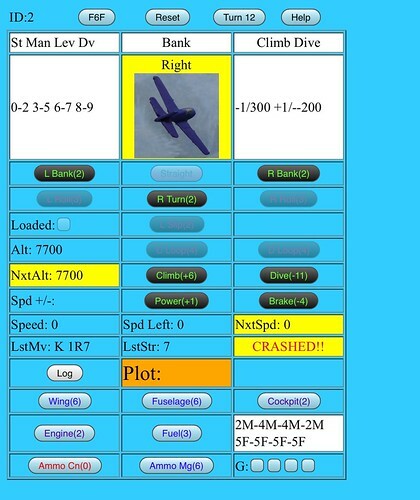 Air Force/Dauntless, the Battleline/AH game of plane to plane combat updated for the computer age. Tabletop 1/300 scale plane to plane combat with a computer aid using your Wi-Fi enabled tablet computer to handle movement and all those pencil and paper calculations of speed and altitude. Bring your tablet, laptop or smartphone that has a WWW browser. This really appealed to me, being A) a big tablet nut, and B) liking plane to plane combat games. The part that REALLY appealed to me was the clever idea of automating the combat tables for movement and combat away from the paper rulebook (which you can get here as a PDF) and onto a server, which can be viewed through any smart device, like a tablet, ipad, smartphone, etc. I played it on an Ipad Air Tablet; Garrett used an Iphone 5. 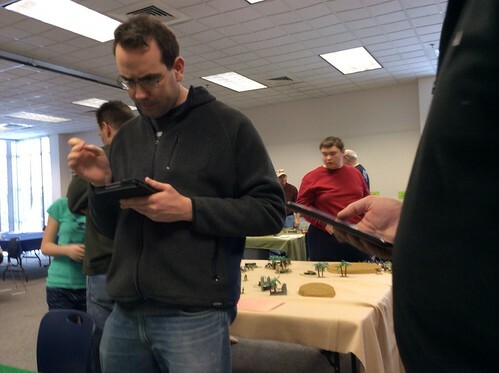 Other players used Kindles and generic Android Tablets, all provided by Dennis Wang. Two tablets being used during the game, it all went splendidly! Mr. Wang, pictured below, set out a very simple scenario. A group of Aichi D3A Vals were attacking a US picket destroyer “somewhere close to the main American fleet”, which was somewhere close to the Japanese mainland in 1944. They are escorted by two advanced Zero fighters (possibly the A6M5 or 6)– both Japanese aircraft were obsolescent by 1944 standards, but the Zero much less so. The Americans, me and another fella (Tuscaloosa on TMP), were both flying a single F6F Hellcat, if memory serves. 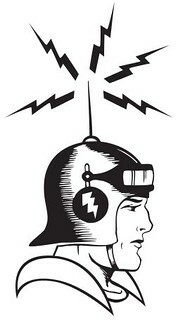 Our job: destroy or disrupt the attack. The job of Garrett and the other Zero fighter was to keep us off of the Vals. Dennis ran the Val attack. I ran the picket ship Anti-Aircraft fire as well. 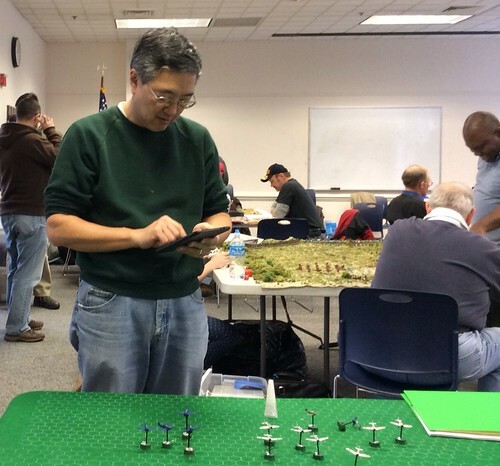 Mr. Dennis Wang, creator of the mobile device Air Force game, setting up the scenario. Start Screen for F6F. The Vals were handled slightly differently, but the Zero pilot players also saw a similar screen. The original Avalon Hill game came with a series of data cards that essentially guided you through the physics of combat maneuvers and firing. Mr. Wang’s computer program condenses the information on the card into a browser based app that basically tracks all that information, including ammunition, fuel, and damage. 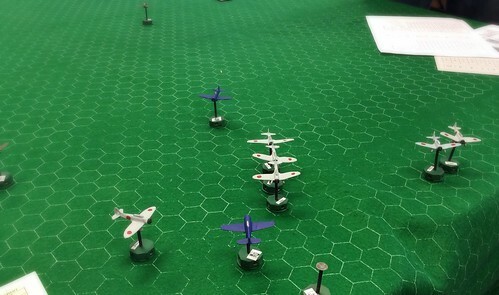 Two F6Fs take on a small horde of Japanese. My colleague on the American side, Tuscaloosa, was used to the game and Mr. Wang’s implementation of it, and had a better idea of the maneuvering. The point of this scenario was NOT to engage Zeros, but to splash as many Vals as possible. 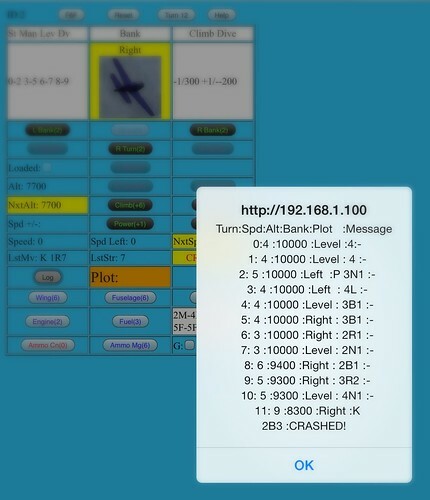 Yet, I dove on the Zeros and managed to inflict some damage on Garrett’s plane. Unfortunately, I shot pasthis plane and found myself shooting away from the action quickly as the diving Vals gained speed. 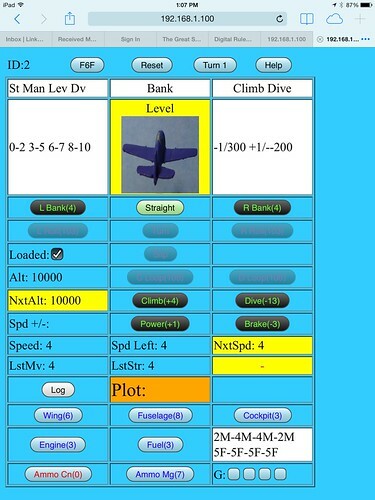 In Air Force, as in reality, a plane gains speed in the dive, and loses speed in the climb. We all started at 10000 feet and the Vals split up and were descending to their target, the picket boat, every turn until they hit max speed. Lesson 1: go after VALs not ZEROs. In the background, my Hellcat has just shot past the Zeros after a short dogfight. The Vals spread out to make a harder target and Tuscaloosa is desperately trying to catch up. At this point, it’s looking grim. Speed was tricky. Mr. Wang made a big point of this in the game briefing. If we see a red message in the status window, we had to pay attention to it. Alas, I didn’t. I tried to wing over and dive to the right after the Vals on the right. I tried to descend far too quickly and the wings came off my plane. Not the status on the bottom right yellow box. Yeah. That sucked. At least the log file tells you what you did wrong. Mr. Wang was magnanimous, and gave me another F6F to throw into the fight because at this stage it didn’t look we were going to be able to do much to stop a Japanese victory. I didn’t manage to do much but damage a single incoming Val with aircraft gunfire and I splashed one with Heavy AA fire. I think if the game had continued a few more turns we might have splashed a few, but the Vals achieved their objective, which was to get to the Picket boat. Lessons Learned: I should have turned and dived after the Vals immediately and not even cared about the Zeroes. We might have splashed about two before they got to the Ship. The quality advantage of the F6F over the Val was negated by basic physics.. they were accelerating away from us in a dive WAY too fast for us to catch up. We didn’t have much of a chance of winning after the second or third turn, but you have to try, right? As far as the technology implementation, I thought this was a brilliant approach to the game. 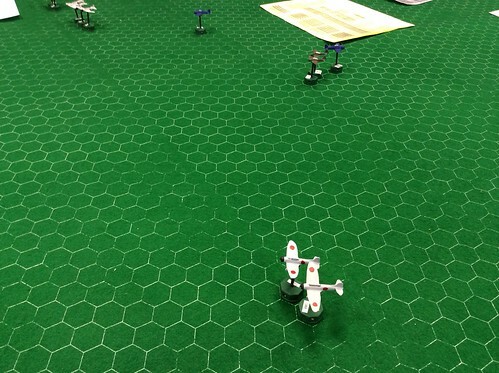 I remember playing Air Force (the board game) when I was 20ish and it was enjoyable, but very slow to plot and execute movement and combat with 2D cardboard chits. I think Mr. Wang is on to something. The explosion of mobile devices (NOT necessarily Ipads) means this technology (which is web-enabled, therefore not dependent on a particular OS) is going to be increasingly available for gaming. A Kindle, any Android tablet, a smartphone or Iphone.. they can all handle this kind of server-based implementation of the rules. Rules were minimal. There were two charts, with some basic maneuvers associated with AIR FORCE that were used (See the slideshow link, below). I ignored them for the most part and used my tablet. I still had to use a paper chart to roll gunfire and antiaircraft fire on, and Mr. Wang had to keep track of several Vals on a roster. I think there’s a great future for this, even as a commercial program. I hadn’t played Air Force in decades, but playing this game made mewant to scamper out and buy some planes and try this myself, being an Ipad nut. So, in sum, well done, Mr. Wang, I really liked this event and I liked your implementation. Keep working on it, your efforts are appreciated. A rather unique approach to the game, thanks for an interesting read and greetings from PGR Team! Nice idea. I wonder how much the tabletop adds given the models are only painted in a basic style – could it be better done on another window of the Ipad/computer? 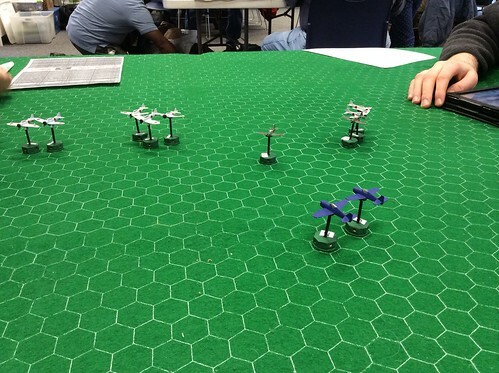 Still – a tabletop and miniatures does add a focal point essential for a convention game and is cheaper than a large scale display.